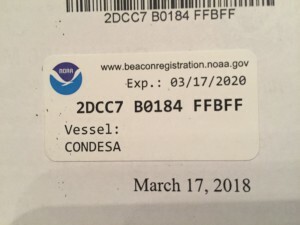 I recently received an email from NOAA, asking me to update my EPIRB registration, as it was expiring after two years. I clicked a link, where I was quickly taken to a website (www.beaconregistration.noaa.gov) to review all my personal data and emergency contacts. It hadn’t changed, so I clicked approval, and a week later received an updated sticker in the mail. For Luddites, the process could all be done on paper, on the back of the form that came in the mail. There are many stories about EPIRBs being linked to inaccurate or outdated information, causing massive confusion and expense in rescue operations, so it serves everybody’s interests to keep this information up to date. People are lazy – I know I am – so it helps when a process like this is quick, easy, and FREE. Kudos to NOAA for making it this way!